Queen of Pop Madonna called President Barack Obama a "black Muslim" at a recent concert, saying she will bare all if he wins a second term. The 54-year-old singer, who performed here on Monday night, asked everyone in the audience to vote for Obama, reported Fox news. "You all better vote for Obama, OK? For better or for worse, all right? We have a black Muslim in the White House! Now that's amazing... "It means there is hope in this country. And Obama is fighting for gay rights, so support the man," Madonna said. 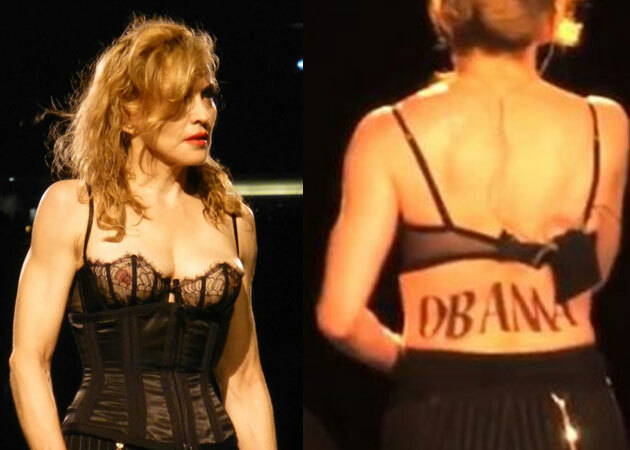 Madonna also stripped down to her underwear to reveal "Obama" stenciled in big letters on her back. "When Obama is in the White House for a second term I'll take it all off," she added. Obama is Christian and has spoken and written widely about his faith. Madonna's comments came in the middle of an extended speech that touched on Martin Luther King Jr's legacy and traced the civil rights movement from America's inception to Obama's election. yes u are right i hope America vote for Obama.